This mixer does a lot. It comes loaded with four Lexicon effects engines. It is very easy to use. Each of the 24 channel's have in and out, gate, compressor, 4-band parametric equalizer, and both pre- and post-fader auxiliary send parameter. In the center it has an interactive color touchscreen that you can everything with. It retails for around $9,000. 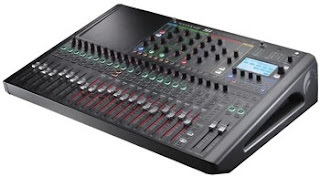 For more info visit Soundcraft here. FaderGlow illuminates the channel faders according to the Si Compact 24's operating mode: amber shows pre-fade Aux sends, green for post-fade sends, blue for FX sends, red for graphic EQ settings, white for stereo channels, etc. Artists and bands submit your music to these radio networks.